Another day, another Jeremy Kyle Show participant called out for their questionable fashion sense. A young woman by the name of Morgan appeared on the famous daytime telly stage to figure out whether her mum, Louisa, had pinched funeral money for drugs and whether she had slept with her own cousin, Jim. 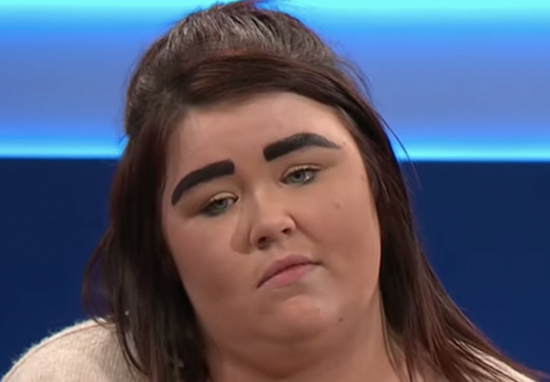 As distressing and as complicated as this storyline was, viewers were far more drawn towards Morgan’s eyebrows which many noted looked as if they had been scribbled on with a Sharpie pen. The family waited tensely on stage for those ‘all important’ lie detector results, which would show whether or not Louisa stole the £1,000 put aside by her aunt Eliza for her mother’s funeral. Despite Louisa vowing to have ‘100 per cent’ innocence, the results showed she had indeed taken the money to fund her drug habit, as suspected by Morgan and her auntie – and Louisa’s younger sister – Laura. Louisa also admitted to smoking weed with her daughter which did not sit well at all with Jeremy. After the lie detector results came in, Louisa protested and stormed off-stage while the sickened audience booed her. When Jeremy asked Morgan ‘What do you think of your mother?’ she simply made a resigned noise of disgust. Laura appeared horrified by the depths her sister had stooped, screaming expletives and threatening to punch her. At one point a security guard had to wade in to keep the warring sisters apart. The only person who appeared to be sticking by Louisa was cousin Jim, who Laura claims was caught out in the act of ‘smooching’ her. The most upsetting thing for me, if I was you, is the way that my daughter would look at me. She looked at you then as if she wouldn’t be able to trust you if you were the last thing on god’s earth. You want to think very long and hard. Shame on you. Your dead mother. Absolutely outrageous. It was a grim enough affair, but viewers were taking to Twitter to discuss one thing and one thing alone: those eyebrows. The daughters eyebrows are like two caterpillars having a stare off competition! Maybe these eye brows are worth a spin to detract from the haters.